Love Asian fusion food? 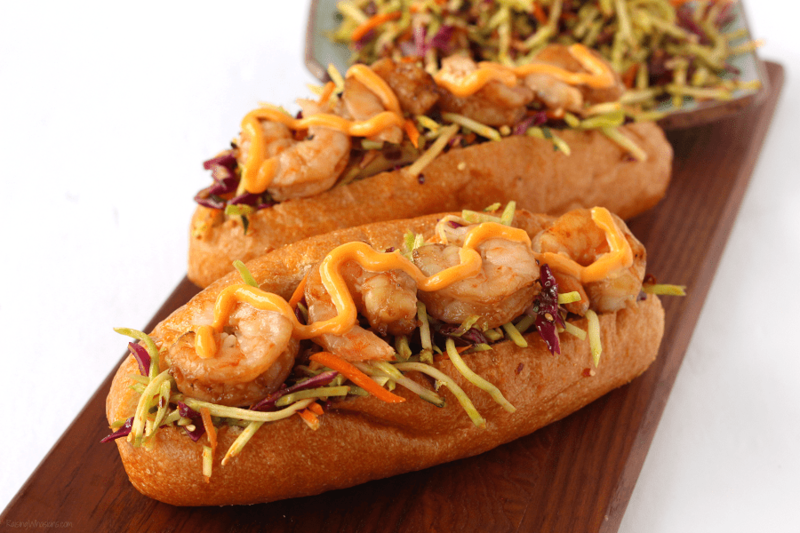 Try this flavorful Asian Shrimp Po Boy with Spicy Slaw – all with my secret ingredient! This post is sponsored by Lee Kum Kee. All delicious opinions are my own. May contain commissioned links. Asian roots with American inspiration, it’s kind of how I see my life these days. While I’m adopted from Korea, I strive to balance the Asian part of my heritage and the American upbringing I’ve had. It’s so important, especially now that I have two kids looking up to their mama for cultural direction. Food is where I find balance. I’ve always had a deep love for Asian food, it’s my love language. When I get to combine the Asian flavors I love with my American taste buds, you know it’s going to be a party. 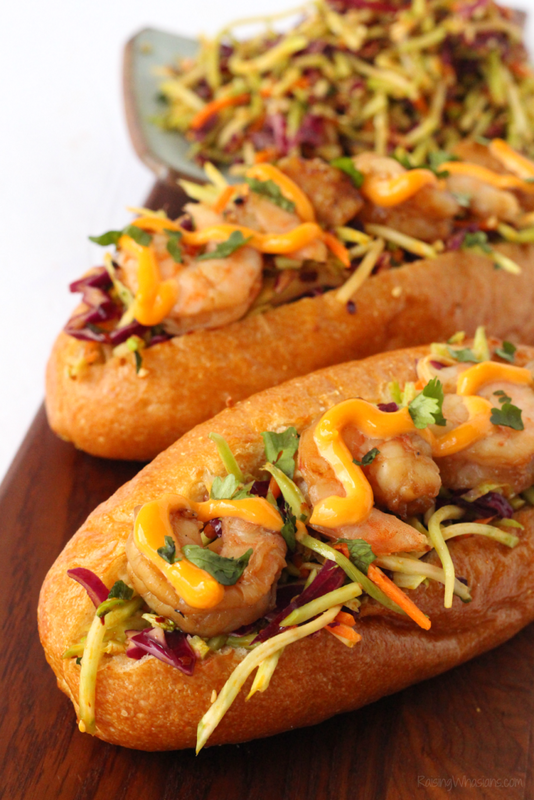 This Asian Shrimp Po Boy with Spicy Slaw is where the party is at. This zesty and crunchy slaw combined with traditional Asian sauces all in one amazing sandwich – it’s one of my favorite recipes to date. Check out my secret ingredients to this amazing dish from Lee Kum Kee, why I have 130,000 reasons why you need to grab a hoagie roll PRONTO. Authenticity. I strive to be authentic not only in my words, but also in my taste buds. Asian food just doesn’t taste right without authentic ingredients. That’s why I use authentic Lee Kum Kee sauces for my Asian fusion cooking. For over 130 years, this Asian sauce brand uses only quality ingredients for the most authentic Asian infused flavors. 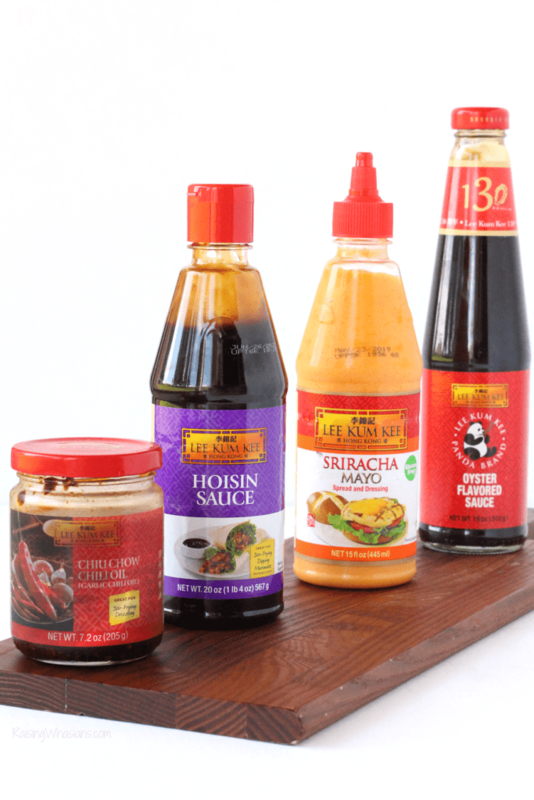 or dipping in more modern flavors like their Sriracha Mayo on top of your sandwiches, Lee Kum Kee provides my family with a variety of tasty Asian sauce blends for our Asian fusion dishes. Enter the Lee Kum Kee 130th Anniversary Recipe Contest & Win! Invite your family and friends to vote for your recipe! Recipes are accepted through October 31, 2018, so there’s plenty of time to get your favorite Asian dish submitted. Top winner will receive $130,000 Hong Kong Dollars! 11 “most liked recipes” will receive HK$13,000! 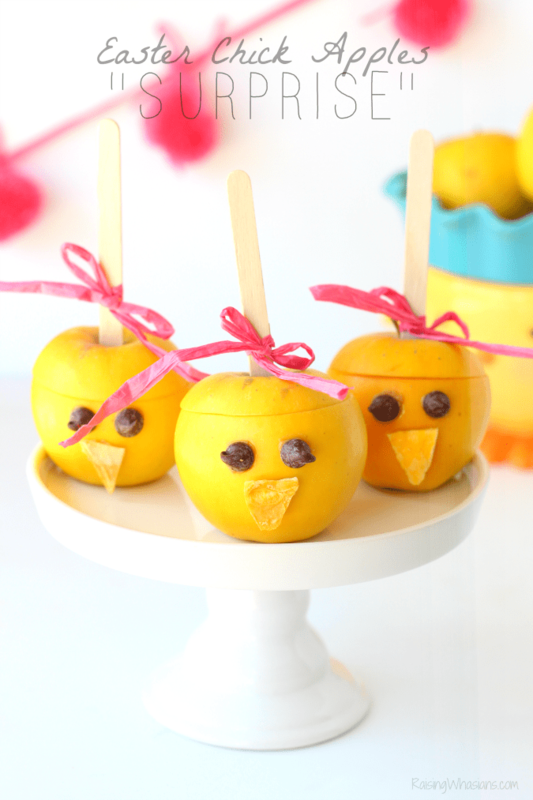 Plus, you can scroll through the entries for more amazing recipe inspiration. Celebrate with Lee Kum Kee and it’s 130 years of authentic flavor and quality! 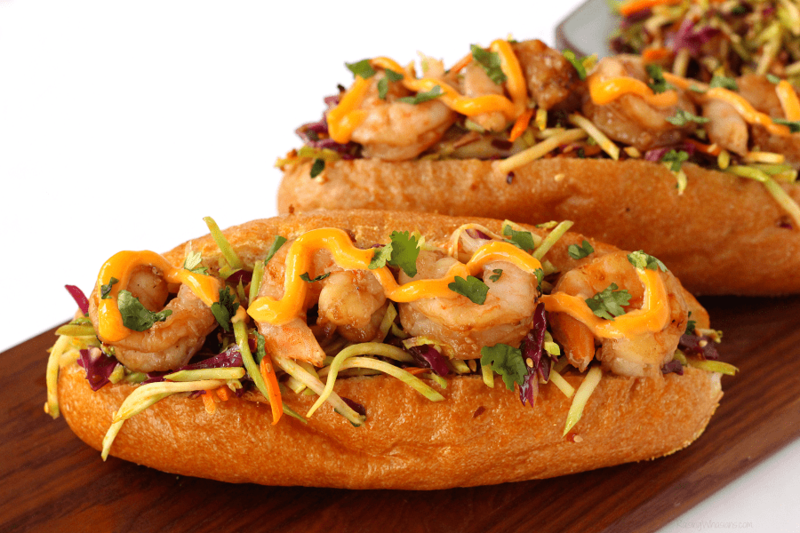 And this Asian Shrimp Po Boy with Spicy Slaw is to die for. I’ve always been a huge sandwich fan. So when you combine all of the Asian infused flavors of the shrimp marinade to the spicy slaw and then topped with sriracha mayo? The flavor combo is DIVINE. 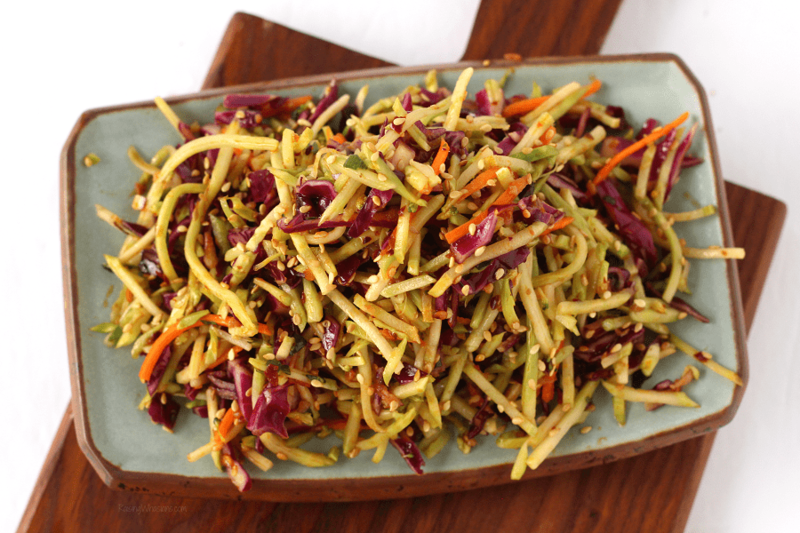 My secret ingredient is the spicy Lee Kum Kee Chiu Chow Chili Oil – making this slaw the star of this recipe. Chiu Chow Chili Oil is an authentic regional chili sauce originating from Chiu Chow, China. It’s prepared from the finest chilies and garlic then blended with soy bean oil into a delightful spicy sauce. This sauce is perfect for spicing up any dish and also great for amplifying dressings, marinades and stir-fries. We’re going to need time for the spicy slaw marinade to infuse, so let’s tackle that first. Combine your rice vinegar, soy sauce, sesame oil, Lee Kum Kee Chui Chow Chili Oil (be sure to give it a good stir first to grab those chili flakes at the bottom! ), fresh lime juice, and garlic in a small bowl. Whisk well and refrigerate for at least 2-4 hours (I let it sit overnight). Meanwhile, mix together the grilled shrimp marinade ingredients (Lee Kum Kee Hoisin Sauce, Lee Kum Kee Panda Brand Oyster Sauce and garlic) in a small bowl. Pour into a resealable bag (reserving about 2 teaspoons for grilling). Add shrimp and mix until coated. Refrigerate for 2-4 hours. When the shrimp is marinated, fire up the grill. Place shrimp on skewers and grill for about 5-7 minutes per side on low/medium heat until fully cooked, basting in extra marinade for the last 1-2 minutes. Mix broccoli slaw, red cabbage, green onions and toasted sesame seeds in large bowl. Pour over slaw marinade and gently toss until coated. Fill hoagie roll with slaw. Place grilled shrimp over the slaw. 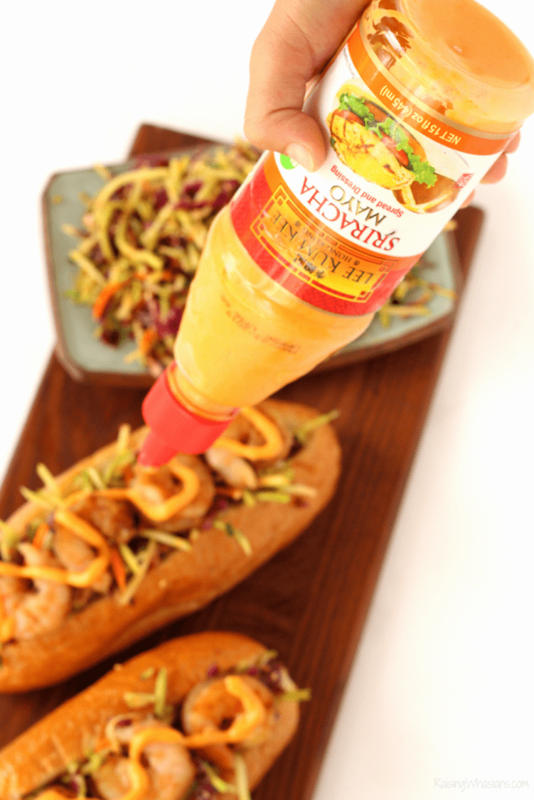 Top with Lee Kum Kee Sriracha Mayo, combining traditional flavors of Sriracha with the cool and creamy texture of mayo. Serve immediately. 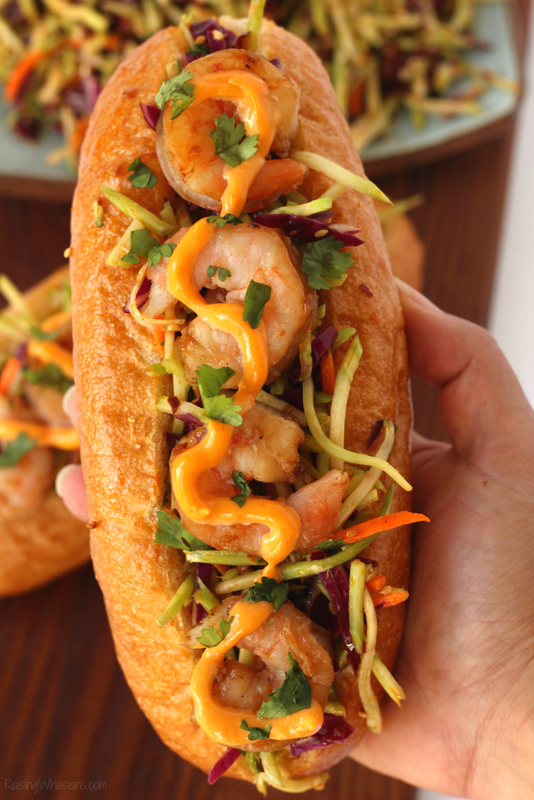 Makes 4 Asian Shrimp Po Boy sandwiches. We're going to need time for the spicy slaw marinade to infuse, so let's tackle that first. Combine your rice vinegar, soy sauce, sesame oil, Lee Kum Kee Chui Chow Chili Oil (be sure to give it a good stir first to grab those chili flakes at the bottom! ), fresh lime juice, and garlic in a small bowl. Whisk well and refrigerate for at least 2-4 hours (I let it sit overnight). The spicy slaw is addicting, y’all! I seriously took a fork to the extra slaw and gobbled the leftovers up. 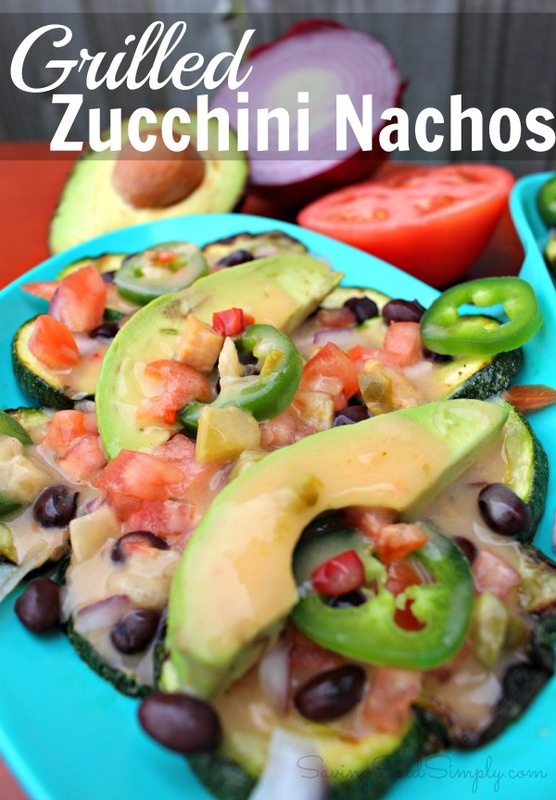 The crunch combined with the spice is ah-mazing! Make the marinades the night before for a quick Asian fusion meal idea. I seriously LOVED how this recipe came out – and infused all of that rich Asian flavor into my sandwich. Cooking Asian fusion food allows me to bring just a little piece of authentic culture into my life. 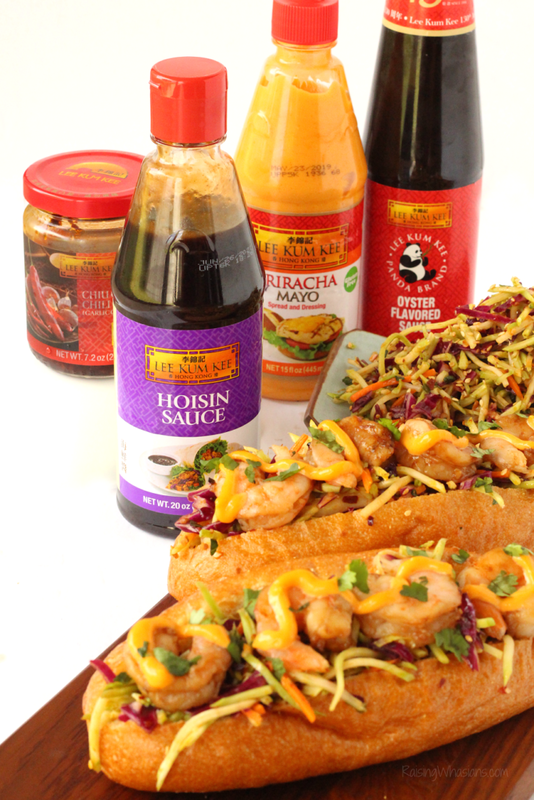 Bring authenticity to your Asian cooking with Lee Kum Kee sauces, available on Amazon and your local Walmart store. With over 130 years under their belt, they know Asian food! 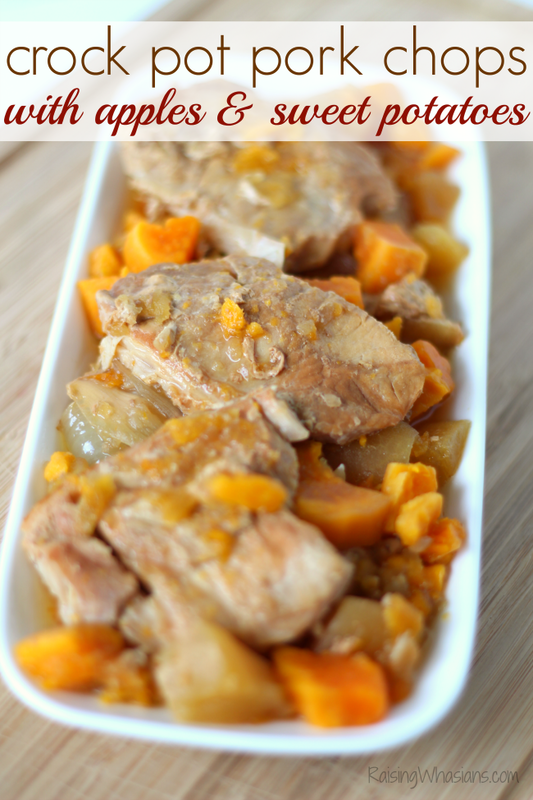 Be sure to head over to the Lee Kum Kee website for more delicious recipe inspiration. And don’t forget to enter the Lee Kum Kee Recipe Contest through October 31st, for your chance to WIN! *Grand Prize: HK$130,000 in cash or equivalent value. Please note the final US dollar amount will be determined by the spot exchange rate on December 31, 2018. What Asian fusion food are you loving right now? 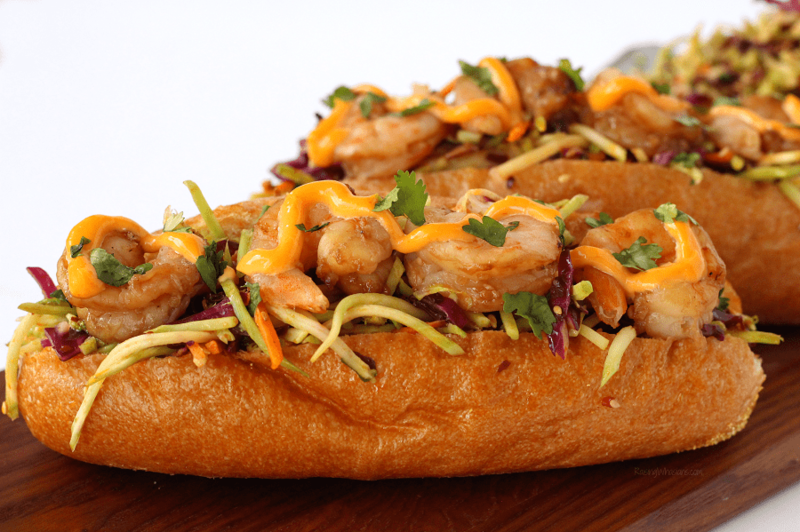 Would you try this Asian Shrimp Po Boy with Spicy Slaw? Looking for more delicious recipe inspiration? Wow! It looks so good! I love Po-boy sandwiches! but this looks amazing, Literally mouthwatering! I need to try it, I know my guys will love it. Thank you fro sharing!